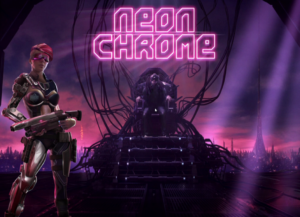 Neon Chrome is a top-down shooter released in 2016 by 10tons Ltd for Windows 10, Mac OS X, and Linux on Valve’s Steam platform. My wife got me a copy of it from Humble Bundle in the Humble Very Positive Bundle 2. This bundle will disappear in the next 13 days, so if you like what you see, go pickup a copy. 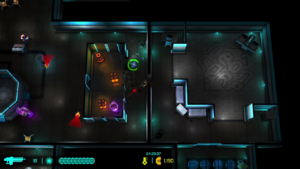 I wouldn’t say I’m particularly a fan of top-down shooters, but Neon Chrome is sharp. You can tell a great deal of thought and imagination went into the creation of this game. The game is set in a cyberpunk future in a large arcology complex called Neon Chrome, run by Neon Corp, which is home to over a million people. The Overseer v1.0 is an artificial intelligence tasked with the responsibility of taking care of Neon Chrome and its inhabitants. 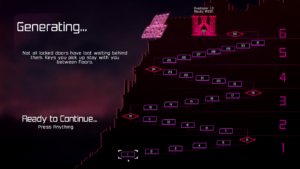 The game starts the player off in a tutorial to help the player learn the controls. In this tutorial, the Overseer explains how while he is entrusted to take care of all of the lives within Neon Chrome, the trust goes both ways. He informs the player that she is scheduled for termination and as she fights her way through the level leads her into a trap. 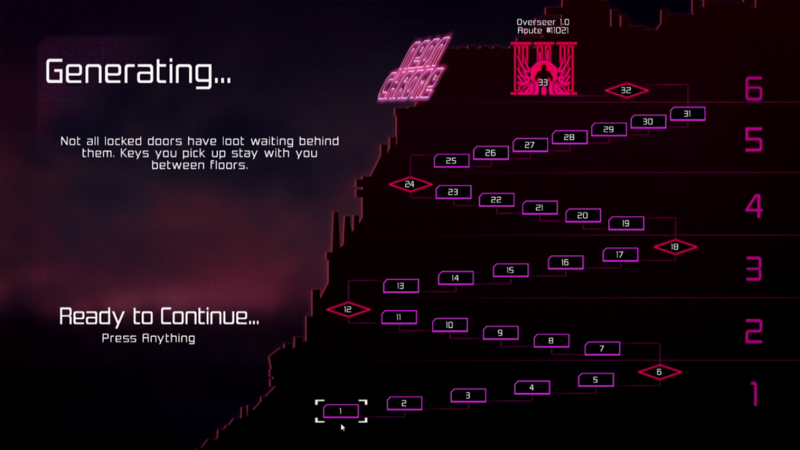 Once the player dies at the end of the tutorial, the game fades into the Immersion Room, from which all missions start. 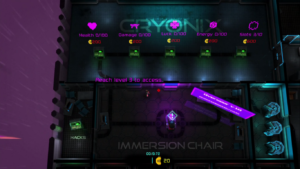 The Immersion Room contains power-ups that can be purchased after completing level three and hacks that can be implemented once the player has defeated Overseer v1.0. It looks like there are 33 levels on the way to defeating Overseer v1.0. 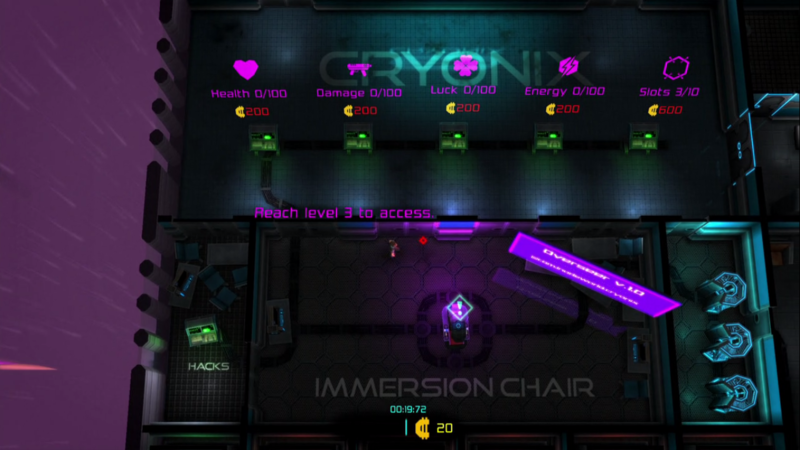 By sitting in the Immersion Chair, the player begins level one in a new asset in a different section of the Neon Chrome complex. The Pathway to the Overseer. I haven’t quite discovered what an asset is in this game. I’m not sure if it is an actual human body that the player assumes control over, a cybernetic robot controlled remotely, or some sort of replicant hybrid in-between. The number of assets are finite, they are all numbered in the room where they wake up from hibernation. When walking to the edge of the room you can see there are other rooms with more assets in them. I don’t know what the game’s limit on the number of lives is, if there is a limit. 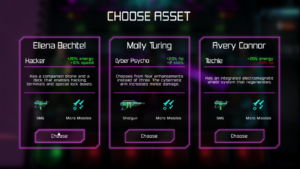 When sitting in the Immersion Chair, the player gets to pick from three asset classes which come with a few different attributes. 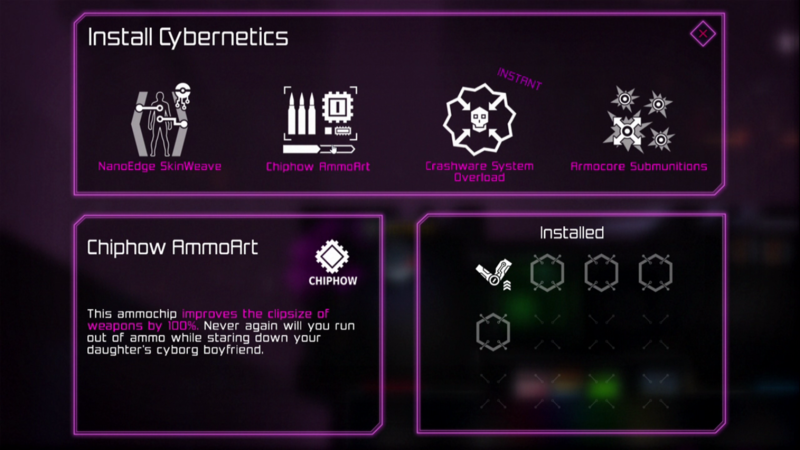 Cyber Psychos get a boost to health and get two additional slots for cybernetic enhancement. Techies get a boost to energy and have an personal shield that regenerates over time. Corporate Soldiers have a riot shield that reduces hits taken to their face by 25%, along with a 15% bonus to damage inflicted from fighting. 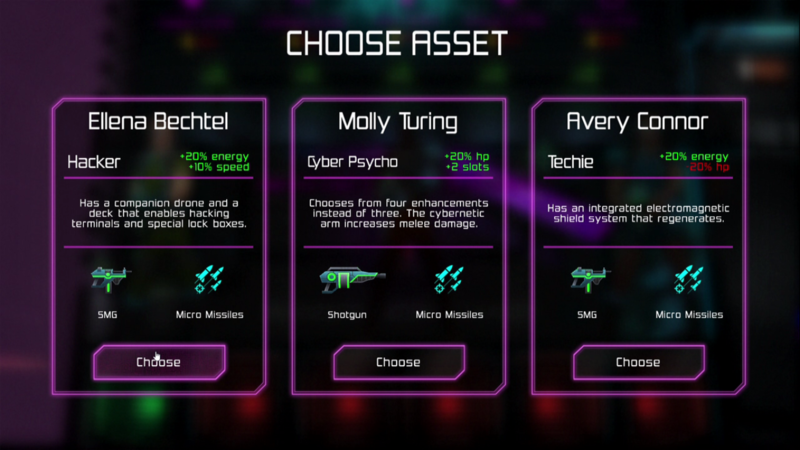 Hackers get a boost to energy and speed, and are proficient in picking locks for additional loot. They also start with a nifty little robot that shoots enemies alongside the player. I personally found my greatest satisfaction in playing the Hacker class. Hackers seem built for stealth and setting traps, and it seemed to become more my style to lure the enemies into a bottleneck for me to pick off one at a time, or to evade altogether by sneaking through doors while their backs were turned. 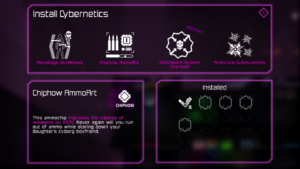 On some levels, there are places where you can upgrade your character’s cybernetics with different abilities. It’s interesting to play around with all of the options. Being as inexperienced as I am, the best option for me was usually to destruct all of the robots on the level. 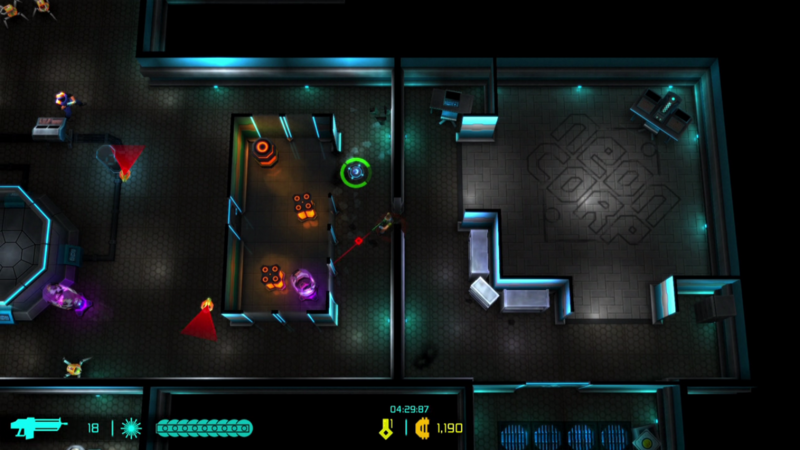 Neon Chrome is not a terribly easy game and takes some practice, and I’m not very good at top-down shooters. But the more you play, the better at it you get, and it’s actually quite a lot of fun. 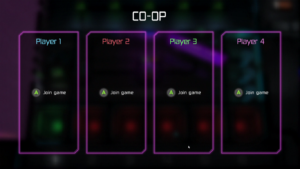 Neon Chrome was designed for up to four players to play simultaneously and cooperatively on the same local machine. This is a good game to hook up to a big-screen television with four game pads to play with your friends. I have been playing it with a keyboard, but it might me much easier when I switch to my Steam controller. I am a sucker for a futuristic cyberpunk theme, and this is where Neon Chrome really shines. If you are a fan of William Gibson’s novel Neuromancer, Ridley Scott’s movie Blade Runner, or other similar artworks of science fiction, then you’ll be right at home with Neon Chrome. 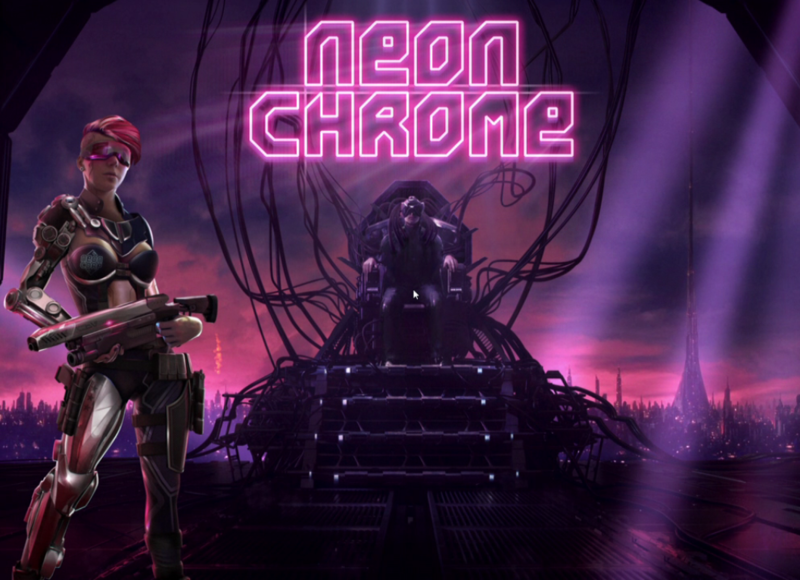 With the dark foreboding background invaded by neon lights and lasers, and an inspiring soundtrack that fits with the theme, Neon Chrome delivers a rich gaming experience. The graphics are crisp. In some of these top-down shooters it’s hard to make out what I’m looking at from the top-down perspective. I have had fewer issues of this with Neon Chrome. I think I will be playing a lot more of Neon Chrome in the days to come. It’s easy to pick up and play, it’s fun, it’s addictive, and it supports multiple players as a Steam Box title. As I said earlier, at the time of this writing it’s also on humble bundle, so you can support a good cause and get a great game simultaneously.